In the Ligurian city of Genoa, lives The Wolfsoniana, sister to The Wolfsonian—FIU in Miami Beach. Mitchell “Micky” Wolfson Jr., businessman and collector, split his lavish belongings between both coastal towns, granting one part to FIU and the other to Palazzo Ducale Fondazione per la Cultura in Genoa, later renamed The Wolfsoniana. The vast collection includes paintings, ceramics, books, furniture and more from 1850 to 1950. Now The Wolfsonian—FIU is expanding its global scope with Made in Italy: MITA Textile Design 1926–1976, its first-ever major collaborative exhibition with its kindred museum. It was also organized in cooperation with the Consulate General of Italy in Miami. Silvia Barisione from The Wolfsonian and Matteo Fochessati and Gianni Franzone from The Wolfsoniana curated the exhibition, which borrowed many of its items from the Italian museum’s collection. 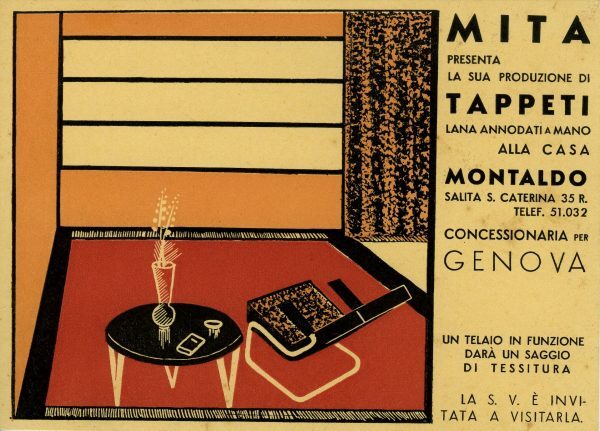 The display spotlights the stellar work of MITA (Manifattura Italiana Tappeti Artistici), an Italian textile manufacturer founded in 1926 by Mario Alberto Ponis. 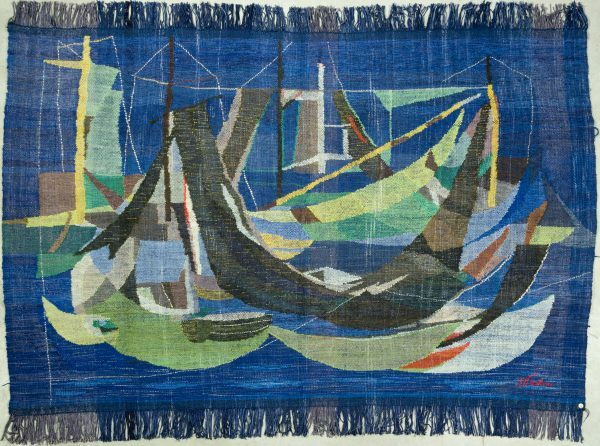 During its 50-year run, which witnessed World War II and the rise of fascism in Europe, MITA built its name for manufacturing striking fabrics, rugs and tapestries designed alongside some of Italy’s leading artists and architects. Ponis’ vision when opening MITA was to produce rugs whose technique was “in harmony” with the antique technique of traditional Eastern rugs, like those of Turkey and Iran, says Fochessati. “But he also wanted to modernize them and create something more fit to the new times,” he adds. By working with Italy’s most sought-after designers — such as Novecento-style architect Gio Ponti, abstract sculptor Arnaldo Pomodoro and painter Enrico Paulucci — MITA’s textiles had an abstract and modernist edge. These were showcased around the world, privately commissioned and tastefully decorating some of the most luxurious ocean liners of the time, such as the shipwrecked Andrea Doria. MITA adjusted to the artistic and political climates in Italy, completely renovating its production following World War II. The manufacturer closed in ’76, six years after Ponis’ death. Barisione, who previously worked with Franzone and Fochessati at The Wolfsoniana before moving to Miami’s Wolfsonian in 2011, says the exhibition is an opportunity to promote MITA’s production abroad and honor its historical ties to Italian visual art. The collaboration with The Wolfsoniana strengthens FIU’s ties to Genoa. Its three-month study abroad program for architecture students includes courses taught by Franzone and Fochessati. Regular visits to The Wolfsoniana and other historic sites in town give students a chance to engage with Genovese culture. Cristiano Musillo, Consul General of Italy in Miami, sees this exhibition as a chance to celebrate the cultural ties between both port towns. Made in Italy: MITA Textile Design 1926–1976 will be on display at The Wolfsonian—FIU until April 28, 2019. Admission is free for students, faculty and staff of the Florida State University System.